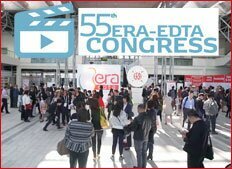 e-posters and dialogues with faculty, click on E-materials at the ERA-EDTA 2018 dedicated section on ENP. Log in with your badge number at your existing ENP account or register on ENP. Visit the e-campus in Hall E.
COMPLETE 10 DIGITAL LEARNING ACTIVITIES AND GET AN ENP T-SHIRT FOR FREE! stamps on the ENP Learning Quest yer you received together with your badge, pick up your T-shirt at the Learning Quest Station next to the Poster Help Desk in Hall E.
For any questions please contact the service staff on the ENP station at the e-campus.